Financial globalisation triggers tax competition among countries and the possibility of a ‘race to the bottom'. This can chip away at the domestic tax base, and the reallocation of international capital is likely to result in the downscaling of the scope and size of redistribution under the welfare state. This column argues, however, that even a reduced welfare state can still act as a device to compensate the losers from financial globalisation losers in a Pareto-improving way. By 2017, China had become one of the most important sources, and destinations, of FDI among the economically more advanced economies, such as the US, the EU, Hong Kong, South Korea, Taiwan and Singapore. Chinese inward FDI as a percentage of GDP was 13.7% in 2014, 10.9% in 2015, 12.1% in 2016, and 12.6% in 2017. Chinese outward FDI as percentage of GDP was 2.4% in 2014, 9.8% in 2015, 12.1% in 2016, and 12.6% in 2017. Import competition from China, which surged after 2000, was a major force behind both reductions in US manufacturing employment and – through input-output linkages and other general equilibrium channels – weak overall job growth. Although it certainly had substantially different employment repercussions in different commuting zones, import competition from China did not have large aggregative effects in the US; the relative reductions of employment were regionally concentrated. Globalisation and income distribution has been studied mostly from the perspective of an international trade paradigm. Stolper and Samuelson (1941), early on, explained how increased international trade with capital-intensive goods and labour-intensive goods, between labour-abundant and capital-abundant countries, would reduce the relative wage in the capital-abundant country, hence increasing the income gaps between capital and labour. However, Krugman (2008) points out that while standard economic analysis predicts that increased US trade with unskilled labour-abundant countries should reduce the relative wages of US unskilled labor, a slew of empirical studies in the 1990s found only a modest effect. 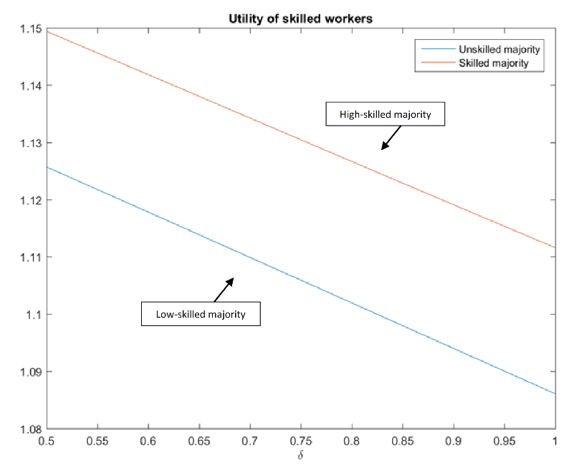 Helpman (forthcoming), assesses that the effects of international trade on the skilled–unskilled wage gap are, however, limited. The recent wave of financial globalisation in the world economy started in earnest in the 1990s, with rising cross-border financial flows among industrial economies and between industrial and developing economies. This was spurred by easing capital controls in many of these countries. 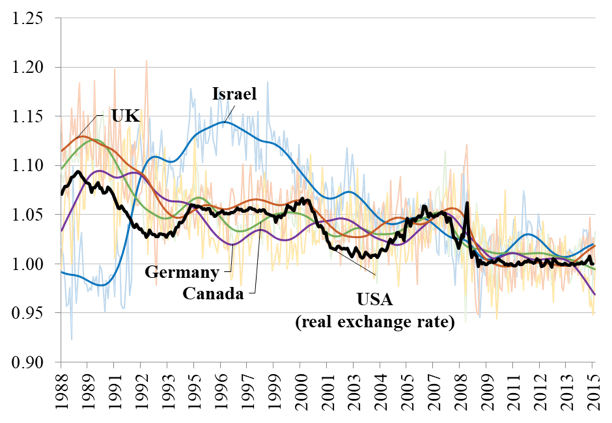 Figure 1 demonstrates vividly that in the late 1990s and early 2000s the real interest rates, adjusted for the real exchange rate, of Canada, Germany, Israel, and the UKconverged towards the US real interest rate – implying that their financial markets integrated significantly into the world financial markets. Note: Series are HP-filtered. Monthly data are shown in the background. Source: Stats Bureau, FERD, World Bank, Real-exchange-rate adjusted, yields on three-month government bonds for Israel, Canada, Germany and the United Kingdom, and the yields on three-month US government bonds. Financial globalisation triggers tax competition among countries, and the possibility of a ‘race to the bottom’. The 2017 US Tax Bill, centred on corporate tax cuts, enhances competitive pressure, which could result in an erosion of foreign countries’ tax bases and an associated loss in tax revenue triggering a new wave of international tax competition. The creation of a single financial market in Europe triggered intensive tax competition. Figure 2 detects a downward breakpoint at the end of the 1980s in the wake of the single market launch in the mid-1990s. Overall, the mean EU effective corporate tax rate fell from 42% in 1975 to 32% in 2000, and the standard deviation fell from 8% in 1975 to 5.8% in 2000. Notes: 1) Hall and Jorgenson (1967. 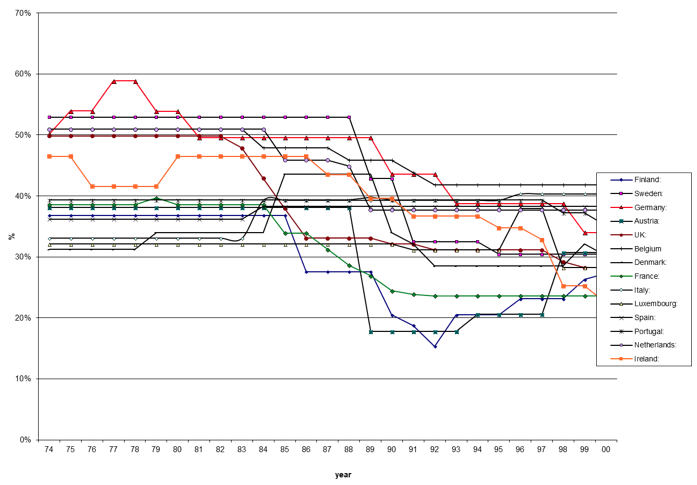 Assumptions: Equity finance, r = 4 %, inflation ratep= 4 %,d= 20 %, Normal tax life = 10 years. 2) Countries (from top to bottom): Finland, Sweden, Germany, Austria, UK, Belgium Denmark, France, Italy, Luxemburg, Spain, Portugal, Netherlands, Ireland. Source: Razin et al (2005). Caminada et al. (2010) explored EU welfare-state indicators, employing a variety of indicators of social protection: social expenditures (both at the macro and at the programme level), replacement rates of unemployment, and social assistance benefits and poverty indicators. Together, these indicators may provide a relatively broad picture of the evolution of social protection in the EU. The authors linearly regress the annual growth rate of several social protection indicators on the initial level of the social protection indicator at the beginning of the period. The coefficient for absolute β‐convergence is estimated using an ordinary least square regression model of cross‐sectional data. If the coefficient β is negative (positive), we say that there is absolute convergence (divergence) in social protection levels across countries. The higher the value of β, the faster the social protection indicator in the poor region converges toward the level of the rich one. The hypothesis to test is that coefficient β is negative. To put financial globalisation, tax competition, and the generosity of the welfare state into a coherent analytical framework, in a recent paper we develop an international-tax- competition model where the welfare state parameters (taxes and social benefits) are determined through majority voting (Razin and Sadka 2018). We consider a two-period small open economy which responds to exogenously given world interest rate, taxes, an imperfect accessibility to international capital markets and strong elements of source-based taxation. The welfare state provides a uniform social benefit. This social benefit captures the various ingredients that the welfare state accords, such as health services, education, in-kind transfers, and so on. Domestic taxes on labour income and capital income are proportional. The degree of globalisation is captured by the ease of moving capital abroad. Specifically, we assume that there is some cost (delta in Figure 3) per unit of investment abroad. By raising the cost parameter, we raise or lower the intensity of globalisation. The incentive for engaging in tax competition is triggered by lowering the foreign tax on capital. As expected, financial globalisation (i.e. lowering the cost per unit of investment abroad) shifts capital from home abroad. Naturally, both capital invested at home and abroad are higher when the high-skilled form the majority than when the low-skilled form the majority. Also, as domestic capital falls with financial globalisation, the rate of return of domestic capital rises and the wage rate falls. Financial globalisation shifts the tax burden away from the mobile factor - i.e. domestic capital – to the immobile factor – i.e. labour. However, the total tax burden becomes smaller, and consequently the provision of the social benefit is reduced. These results obtain regardless of which skill type form the majority. Naturally, the tax rates on capital and labour are higher when a low-skilled type form the majority than when the high-skilled type forms the majority. Comparing the levels of the social benefit under the two regimes, there are two forces at play. On the one hand, the tax rate is higher under a low-skilled majority. On the other hand, the economy is less productive when low-skilled labour is the larger component of the labour force. This force reduces the total tax revenues. In our simulations, the second effect dominates. 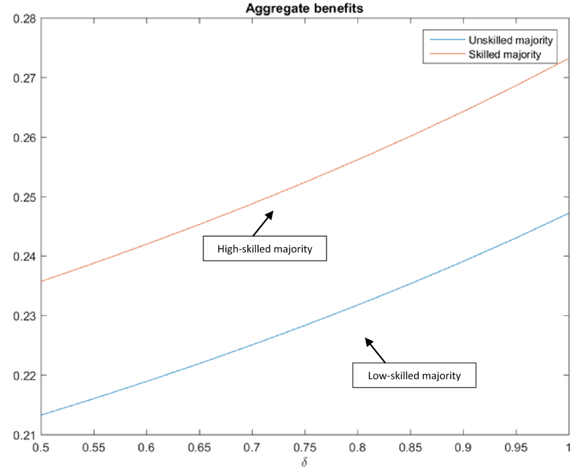 As a result, the social benefit is lower under the low-skill regime. Does a rising tide lift all boats? Note that for financial globalidation to generate a Pareto improvement in a multi-consumer economy, it is essential to have a specific way for the redistribution policy to compensate the losers by taxing the winners. 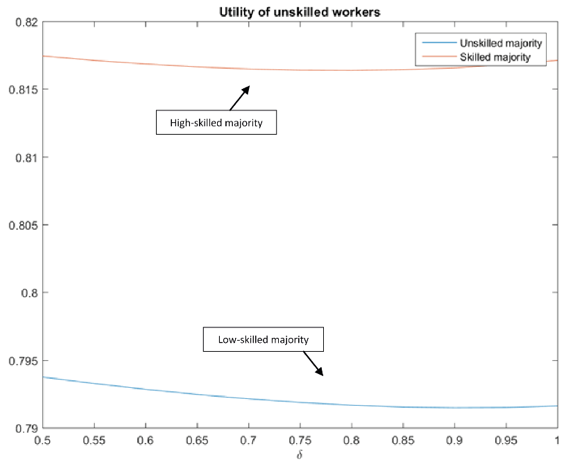 However, our model’s redistribution system is constrained by who forms the majority – low-skilled or high-skilled. Nevertheless, as Figures 4 and 5 indicate, financial globalisation is indeed a Pareto-improving change. Both skill types, regardless of who forms the majority, benefit from financial globalisation. Indeed, the welfare system, either under the high-skilled regime or under the low-skilled regime, acts as a device that compensates the loser at the expense of the winner in such a way that financial globalisation generates Pareto-improving changes. Although we focus in this column on international capital market effects on inequality, international migration can also have significant impact on income inequality through its wage-depression effect. Ottaviano and Peri (2012) calculate the effects of immigration on the wages of native US workers of various skill levels in two steps. They find that there is a small but significant degree of imperfect substitutability between natives and immigrants which, when combined with other estimated elasticities, suggests that in the period from 1990 to 2006, immigration had a small effect on the wages of native workers with no high school degree (between 0.6% and +1.7%). Immigration has a first-order effect on redistribution policy. Razin (2018a, b) addresses the impact on income inequality and redistribution policy for a unique immigration episode in Israel. Caminada, K, K Goudswaard, and O Van Vliet, (2010), “Patterns of Welfare State Indicators in the EU: Is there Convergence?”, Journal of Common Market Studies 48(3): 529-556. Hall, R E and D W. Jorgenson (1967), “Tax Policy and Investment Behavior", American Economic Review 57: 391-414. Helpman, E (forthcoming), Globalization and Inequality, Harvard University Press. Ottaviano, G I P and G Peri (2012), "Rethinking the Effect of Immigration on Wages," Journal of the European Economic Association 10(1): 152–197. King, M A and D Fullerton (1984), “Comparisons of Effective Tax Rates,” in M A King and D Fullerton (eds), The Taxation of Income from Capital: A Comparative Study of the United States, the United Kingdom, Sweden, and Germany, University of Chicago Press. Krugman, P (2008), “Trade and Wages, Reconsidered,” Brookings Papers on Economic Activity Spring: 103-154. Razin, A (2018a), Israel and the World Economy: The Power of Globalization, MIT Press. Razin, A (2018b), “Israel’s immigration story: Winners and Losers,” Israel Economic Review 15(1): 73-106. Razin, A, and E Sadka (2014), Migration States and Welfare States: Why is America Different from Europe?, Palgrave Macmillan. Razin, A, and E Sadka (2018), “Financial Globalization and the Welfare State,” CEPR Discussion Paper 12998. Razin, A, E Sadka, and C Woon Nam (2005), The Decline of the Welfare State: Demography and Globalization, MIT Press. Stolper, W W and P A Samuelson (1941), “Protection and Real Wages,” Review of Economic Studies9: 58-73. The EU permitted free labour mobility among member states, so that union-wide labour market integration was also a driving tax competition force (Razin and Sadka 2014).